One of the great features of the San Francisco Bay Area is the wide variety of recreational activities readily available as a day trip. Once you have chosen San Francisco Bay Area as your destination there are a number of professional companies in the area that provide excellent services to enhance your adventure. Each of these adventures requires a bit of preparation and we hope you will find this page useful. As part of your preparation we recommend packing a lunch, or at least some snacks and refreshments, especially water. Picnic lunches are our specialty so please click on our menu page and let us prepare a complete picnic lunch for you. You can us call ahead of time and we can have everything made fresh to order and packed to go. 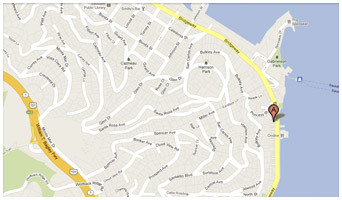 If you are in Sausalito, or passing by on the US 101 take the Sausalito/Alexander Ave. exit, come on in and we'll assist you in getting everything you need for your day. Here are a few ideas to turn your Bay Area getaway into an adventure. One of our personal favorites and trusted services is provided by S.F. Bay Adventures. They have a variety of boats and outings listed on their website but once you see the Freida B chances are you are going to want to sail on this beautiful classic Schooner. 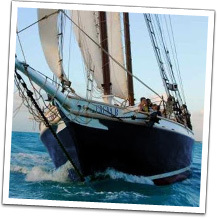 The Freida B is an 80' Classic Gaff Rigged Topsail Schooner with a steel hull. 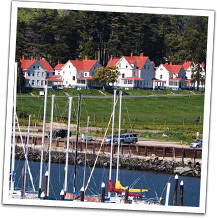 Every time it passes by the waterfront here in Sausalito everyone that sees it is captivated by its beauty and grace. When its out on the bay, sails full of wind, it really is the center of attention. At Venice Gourmet we have a lot of experience catering for SF Bay Adventures, especially on the Freida B. We work closely with the Captain and crew for their whole fleet and once you order food from us we will take care of everything for you, including delivery with no additional charge. Muir Beach Overlook is a must see. The tremendous views of the Pacific Ocean and the California Coast are reminiscent of the types of views seen from Big Sur. Parking and restrooms are available at Muir Beach Overlook and there are even a picnic table or two. A couple of old bunkers remain carved into the hillside. A trail extends out to a beautiful point on the peninsula where you can take some incredible photographs and take in the natural beauty of the area. There is a classic pub called The Pelican Inn located at Muir Beach. This is a fun place to stop for a pint of Guinness and some classic pub grub. They even have rooms if you wish to spend the evening in the area. Cavallo Point is also located in Sausalito and is worth a visit if only for the views of the Golden Gate Bridge and San Francisco. 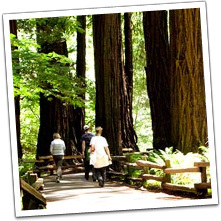 You can picnic in the meadow, take a beautiful short hike on the Bay Trail or even walk up to the Golden Gate Bridge and continue all the way across the span. If you have small children with you, the Discovery Museum is also located at Cavallo Point. Rodeo Beach is also very near to Sausalito. Drive through the tunnel and to the ocean along a beautiful valley of open space. There is a lot of wildlife out here too. There is an equestrian center, a youth hostel and old army barracks that remain from the peak of World War II. 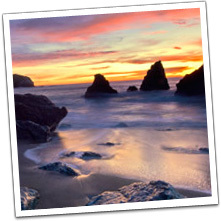 Rodeo Beach has interesting trails, tremendous surf and great history. The view of the sunset from up on the ridge above the parking area is wonderful. 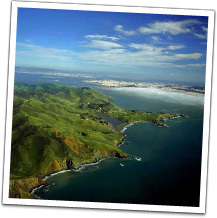 The Headlands area is the hillside ridge between the Golden Gate Bridge and Rodeo Beach. The views of the Golden Gate Bridge and the city of San Francisco are among the most photographed and filmed scenes of all. You can drive up the road on the North side of the Golden Gate Bridge, park you car and enjoy the scenery and history of the Golden Gate. Enrich someone's special celebration with a Venice Gourmet Gift Certifcate, and let them choose from our latest offerings to traditional favorites.